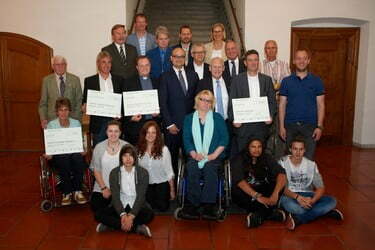 Memmingen Crematorium today donated a sum of 38,500 euros to various projects in Memmingen involved in youthwork, culture and training. Under the watchful eye of Mayor Ivo Holzinger, Stefan van Dorsser, CEO of Memmingen Crematorium, handed over a total of 38,500 euro. Part of that went to the Memmingen children’s hospital for a new play area. And the Roman Catholic Church of St. Josef received a cheque too for renovation of its facade. The Memmingen urban schools community and the contact group for the disabled in Memmingen (the Behinderten-Kontaktgruppe Memmingen e.V.) also got a cheque to restore a wing of their building and as a contribution to a new vehicle.